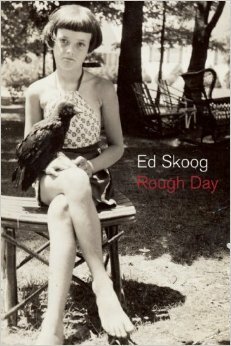 “Poetry is how to live with almost nothing,” proclaims the speaker of Ed Skoog’s wildly expansive yet personal and grief-filled second book of poetry, Rough Day. And though this idea—the belief that poetry can instruct us on how to live more attentively—may have never been rendered exactly in these terms before, the path it points toward is one we recognize. We see this kind of philosophy acted out by holy people in nearly every religion, such as nuns or monks who practice their faith primarily through abstinence. Skoog’s version of this ascetic character is a secular American one—the poet who needs little more than a book of elegies, fresh mink oil in his boots, and a sign so he might flag down his next interstate ride across the country. But the thinking that drives Skoog’s book forward isn’t always so declamatory or even imagistic. “I’m trying to find where influence end,” the speaker says. This sentence first reads like a typo. “Influence,” of course, is a singular noun, and the conjugation of “end” here implies the noun is plural. This odd shift emerges as a pattern throughout the book, a rehearsed maneuver. And in nearly every instance the purpose is similar, pointing out some irrationality inextricably embedded within our grammar. What influence, after all, beyond a hypothetical moment of origin, is ever singular? Doesn’t every influence have an influence of its own? Skoog’s syntactical legerdemain addresses these impossible epistemological questions gracefully, illuminating them in action. There are other formal decisions made throughout the book, however, that could easily be judged as hijinks—the Merwinesque unpunctuated lines that force clauses to slip between sentences; the run-on titles that, by virtue of their typesetting, are indistinguishable from their poems (and make the poems themselves sometimes indistinguishable from each other). But none of these devices ever feels wholly mechanistic. Each formal layer enacts a connectedness, and maybe an absence of definite origin, that the book is obsessed with. Language is a finite set, after all, so each poem is merely ever an inborn inevitability to those that are searching for them. “What’s in these books that have come to me // although they don’t belong to me,” the speaker says. This ultimately is the great strength of Rough Day: a singular multiplicity, a poetic idiom that discovers, re-discovers, and makes itself new, sometimes all on the same page. And despite its overriding sense of loss, it is this fever for change, this need to move, that imbues the book with an enduring hope. Ed Skoog’s Rough Day is the winner of the 2014 Washington State Book Award. Find Kevin Craft’s seven word reviews of each of the nominees here.